1. Fairey Gannet AS.1 XA340 / 292-R, 815 NAS, HMS Ark Royal, December 1957. Extra Dark Sea Grey and Sky finish. Propeller spinners painted in black and white. Serials, codes and lettering in black. "Harp" motif painted on both outer finlets, mirrored. Squadron chest under starboard cockpit. Type D roundels in all six positions. 2. Fairey Gannet AEW.3 XL471 / 43-R, 849 Squadron B Flight, HMS Ark Royal, June 1977. Extra Dark Sea Grey and Sky finish. Propeller spinners painted in black and yellow stripes. Serials, codes and lettering in black. 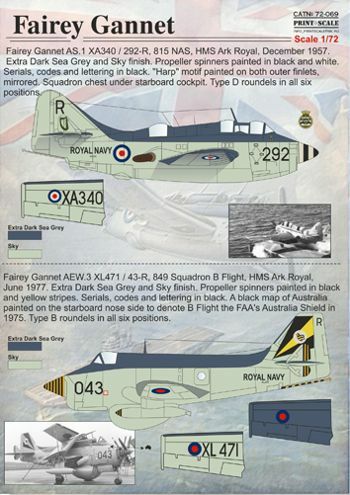 A black map of Australia painted on the starboard nose side to denote B Flight the FAA's Australia Shield in 1975. Type B roundels in all six positions. 3. Fairey Gannet T.2 XA514 / 878-NW, 724 Squadron, Royal Australian Navy. Nowra, mid-1960s. High Speed Aluminim overall. Propeller spinners and antiglare panel in black. 36 inches yellow trainer bands on wings and fuselage. Serials, codes and lettering in black. Australian type D roundels in all six positions. This aircraft was used for live-fire training equipped with a 16 rockets full load. 5. Fairey Gannet AS.1 XA322 / 771-CU, 796 Squadron, 1957. Extra Dark Sea Grey and Sky finish. Propeller spinners painted in red, white and black. Serials, codes and lettering in black. "Pirate's Head" motif painted on both outer finlets, mirrored. Type D roundels in all six positions. 6. Fairey Gannet COD.4 XG790 / 040-R, 849 Squadron B Flight, HMS Ark Royal, May 1970. RAF "Royal Blue" overall. Propeller spinners, arresting gear and last portion of outer finlets painted in black and yellow stripes. Serials, codes and lettering in white. Intake interior in Sky, with metallic lip. Type D roundels in all six positions.